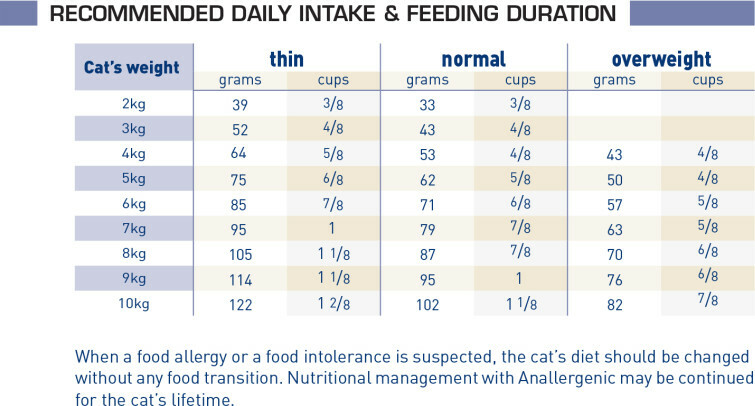 Anallergenic For cats with Adverse Food Reactions (AFR), food allergies, food intolerance, dermataological and/or gastro-intestinal signs, food elimination trail or Inflammatory Bowel Disease (IBD). Formulated with starch instead of whole cereals and a specially designed palatability enhancer; manufactured in a production line designed to minimise contamination. Maize starch, feather hydrolysate with low molecular weight (source of L amino acids and oligopeptides), copra oil, soya oil, vegetable fibres, minerals, animal fat, fish oil, chicory pulp, fructo-oligo-saccharides, maltodextrin, mono and diglycerides of palmitic and stearic acids esterified with citric acid, dextrose, marigold extract (source of protein: feather hydrolysate with low molecular weight (source of L-amino acids of lutein). Crude ash: 8%. Crude fibre: 3.7%. Crude oil fats: 17%. Moisture: 5.5%. Protein: 24.6%. Vitamin A: 2600IU, Vitamin D3: 800IU, E1 (Iron): 40mg, E2 (Iodine): 3.6mg, E4 (Copper): 15mg, E5 (Manganese): 52mg, E6 (Zinc): 190mg, E8 (Selenium): 0.3mg. Technological additives: Clinoptilolite of sedimentary origin: 10g. Preservatives - Antioxidants.